Mr Chris is very much in to NBA Basketball at the moment and requested a basketball cake for his birthday. 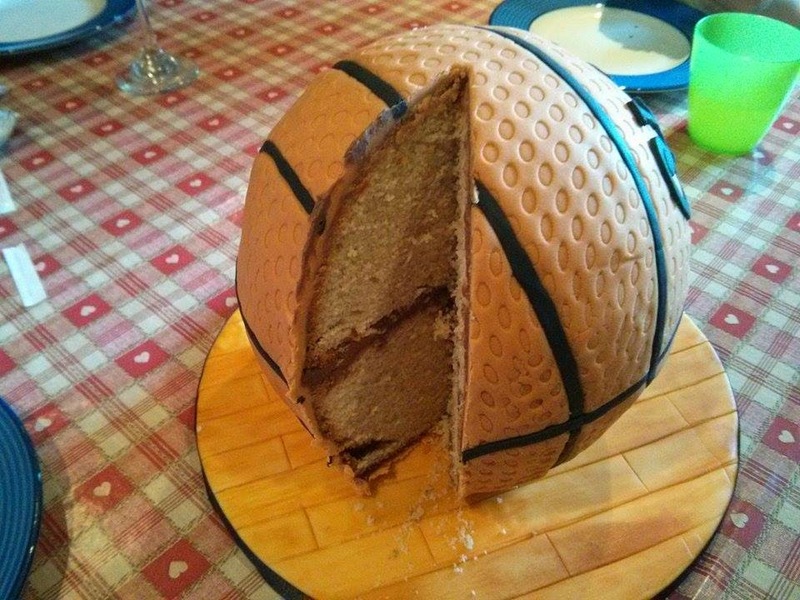 What he actually asked for was half a basketball because in his words, "he didn't want a cake that falls apart" - he was referring to the great cake disaster of 2012. I have to restore his faith in my cakes so I took another sneaky day off work, (you would think he'd have caught on to this by now) and with my lessons learnt tackled another ball cake. This time I did not ignore advice from the experts and read all of the information for ball cakes on Lindy's blog. Instead of a soft sponge cake, I baked a madeira cake following Jane's "Baking the Perfect Madeira" post, again on Lindy's blog. I also allowed plenty of time for it to cool, baking the cake the evening before and leaving it overnight. When the cake came out of the oven, I knew it was going to be more successful then last time. Covering a ball cake with fondant is a little tricky. The idea is to lay the fondant over the cake and form the excess in to two or more pleats around it. The pleats are then cut away and the joins are closed and smoothed out. On this cake it was much harder because I'd created an impression in the fondant (using one of Chris' Lego mats :) ) and I didn't want to loose it. I worked slowly and carefully and for the most part the impression stayed, there were a few spots where it rubbed out but they were near to the bottom so not overly noticeable. I had hoped to add some more finishing touches but ran out of time as Mr Chris finished work a little earlier then usual. He was suitability impressed and he approved of the filling too. I added almond extract and ground almonds to the madeira recipe and used chocolate amaretto buttercream for the filling - I think this could be my new favourite. The lesson this time... "If at first you don't succeed, try try again".